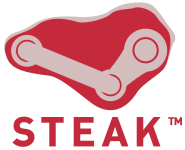 Another dry spell of Steam news is coming to an end. Next week will see the release of the “Steam Winter Update”, the first such ‘seasonal’ release and a departure from Valve’s previously iterative release schedule. Regards to Andy S, who spotted a series of new strings added to Steam’s interface in the recent platform update. ‘Guest Passes’ are on the way: you’ll be able to hand out free copies of participating multi-player games to your friends, through Friends or via e-mail, for them to play online with you.